As visitors walk through the museum’s doors, they are transported back to the days when museums served as cabinets of curiosities, displaying wonderful and weird treasures. Museum founder and luminary, J. Marvin Hunter, Sr., never said no to a gift to the museum’s collection. He felt that if the artifact was important to the donor, then it should be important to everyone. This resulted in the museum’s eclectic and eccentric collection that has amazed visitors for 80 years. Today, the museum also serves to honor the legacies of the American cowboy and our ranching traditions with displays on local rodeo champions, the Harvey Chelf Barbed Wire Collection, the Debbie Henderson Western Hat Collection, and the Frontier Times Museum Texas Heroes Hall of Honor. . The mission of the museum is to preserve and share the cultural heritage of Bandera County and the Texas frontier times. The museum serves the county and visitors through eclectic collections that tell stories through exhibitions and educational programs that promote Bandera County and its impact on the Texas frontier. 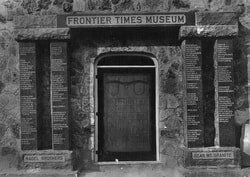 The Frontier Times Museum is the trusted resource center for learning, historical research and information for Bandera County residents and visitors. The museum is a recognized destination that brings visitors to the community. When Hunter had to knock out a wall to accommodate his growing collection, he began to dream of building his own museum. Though the Depression was gripping the country, Hunter worked out a way to raise funds to build his dream. He decided to print a book, The Authentic History of Sam Bass and his Gang, with an edition of 1,000 copies, and sell them for $1 each, to raise $1,000. That amount would be enough to erect a stone building, he estimated. With the harsh reality of the Great Depression, he modified his plan to offer a combination deal of a year’s subscription to the Frontier Times Museum and a copy of the book. 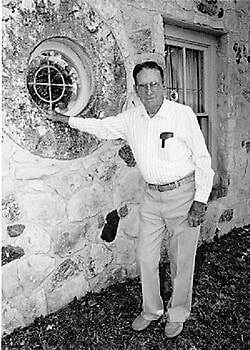 ​Newspaperman and printer, J. Marvin Hunter, Sr., moved to Bandera in 1921 and purchased the weekly newspaper, The Bandera New Era, in 1921. 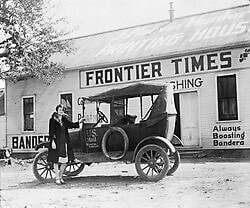 An amateur historian, he was fascinated with stories of the Old West and in addition to publishing the local newspaper, he began publishing his own magazine, the Frontier Times, in 1927. Despite the advent of the Great Depression in 1929, the magazine quickly gained a wide readership throughout the country. Readers of the publication were encouraged to contribute their own tales. Stories from all over the Southwest began to roll in as well as pioneer relics and treasures from the Old West. Soon the New Era office was filled with to the rafters as Mr. Hunter displayed all that was sent to him. In the east wall under the shade of cedar trees, the initials H. L. are imprinted among the limestone rocks. Place there by Hough LeStourgeon, they are a legacy of this great stone mason who helped build the museum. 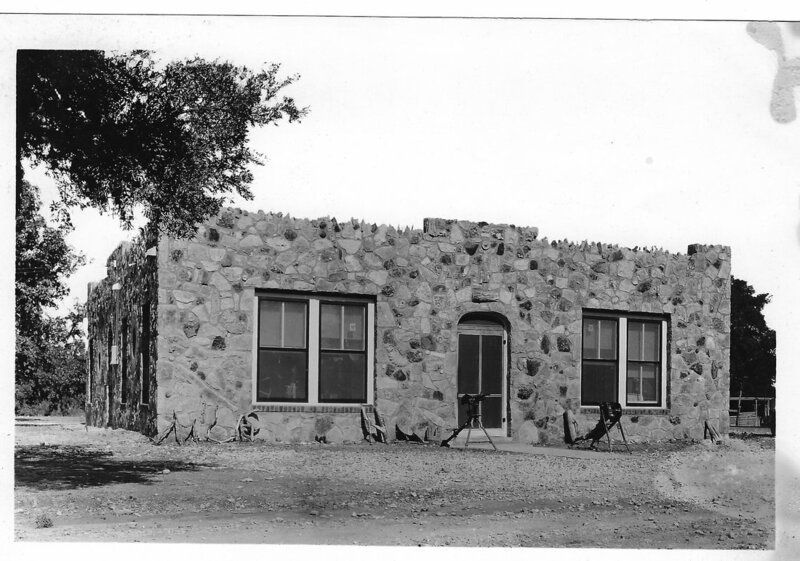 Situated on a site once known as Delightful Hill, J. Marvin Hunter wanted his museum to be fireproof so he asked LeStourgeon to use rocks gathered from local ranches with much of the stone coming from an old rock fence built in 1878. Local residents also brought petrified wood, fossils, and odd shaped stones to be included in the museum wall. One giant ammonite came from as far away as the Pecos River. ​By mid-December, Mr. Hunter had raised enough funds to start the Frontier Times Museum with a groundbreaking ceremony on January 1, 1933. To show his appreciation to those who purchased the book, Hunter had their names engraved on the two granite pillars flanking the building. 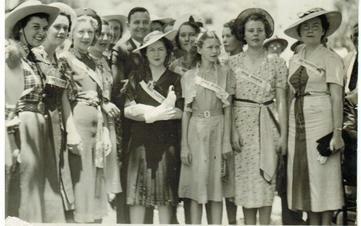 Governor James Allred enjoys the opening of the museum’s Chisholm Hall with local beauty queens. After Mr. Hunter’s death in 1957, the museum was sold in 1960 to Mr. F. B. Doane, a successful businessman who had a keen interest in all things western. After his death a short time later, his widow, and their family foundation, the Doane Foundation, funded and operated the museum. In 1972, the Doane Gallery of Western Art was added to the existing building and Mrs. Doane gifted the museum to the residents of Bandera County. Today the Doane Foundation continues to be a supporter of the museum and its endeavors.